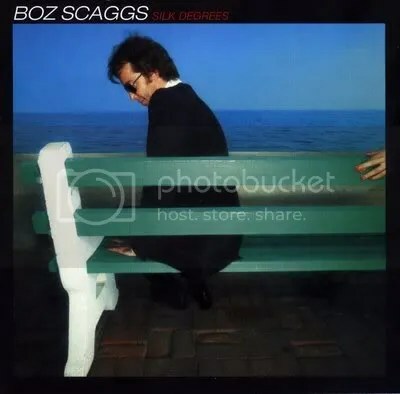 Desert Island Discs: “Silk Degrees” by Boz Scaggs (1976) | Name-Brand Ketchup. ← What’s the difference between an open-carry guy and a flasher? A confession: I hated this album when it first came out in the summer of 1976. Hated it. I was a snotty, arrogant, nineteen-year-old jaded hipster poser. I referred to this as “Slick Debris.” I said that Boz Scaggs sang like Kermit The Frog. I had a default-setting, reflexive, knee-jerk dislike for anything that sold a million copies or more: I reasoned that it was mass-produced simply to appeal to the unenlightened public. Someone described “Silk Degrees” as a cross between Van Morrison and Elton John. “Blue-eyed soul” seems to fit. Produced by Joe Wissert who helmed “Happy Together” by The Turtles, “If You Could Read My Mind” by Gordon Lightfoot, and “One Last Kiss” by The J. Geils Band among others. His talent, I think, is to let the musicians do what they do, and just buff and polish and sharpen the sound. It sure shows on this album. Clean, full-bodied, rich production; notably different in sound quality than the other over-produced music coming out that summer. The simplicity of the production allows the songs to stand on their own two feet. Session musicians shone, like the trio of drummer Jeff Porcaro, bassist David Hungate, and keyboardist/co-songwriter David Paich who all went on to found the band Toto. And there isn’t a bit of filler. Not a bad song on this album. Rita Coolidge had a hit with “We’re All Alone” and Bonnie Raitt with “What Do You Want The Girl To Do,” and many hip-hop artists have sampled the riff from “Lowdown.” There are great little fills like the barrelhouse piano and slide guitar on “Jump Street,” and the double-time cha-cha bit at the end of “Harbor Lights.” But the song that knocked me out, even back in the cynical hipster days, was “It’s Over.” It’s got a great Carolina beach music sound to it. “Lido Shuffle” is the singalong song. A freewheeling song about a freewheeling dude. “We’re All Alone” became a mellow FM radio standard. If you’ve never heard “Silk Degrees,” do yourself a favor and give it a spin. Or even if you have. Don’t let your inner jaded hipster poser get the better of you.